In an unassuming set of white hangars in Novato, California lies a studio that’s been making games for years. Perhaps best recognized for their work on the Skylanders series of games, the studio was actually formed more than two decades before the Spyro-inspired toys-to-life franchise sprang to life, developing games like Star Control, Pandemonium!, and some licensed titles for Activision. I was allowed a small glimpse into their world, and despite turning 30 next year, Toys for Bob remains an imaginative place of childlike wonder. There’s no studio better suited to handle 20-year old Spyro memories than those that have such a reverent respect for the series. From the outside, you’d never know that this is a development studio. A single canvas artwork featuring the purple dragon hangs on the wall across from the clear glass doors. Ascending the stairway begins to tell a different story. More artwork adorns the walls showing a variety of Spyro characters, and once you emerge onto the main floor, it immediately becomes clear that this is the studio responsible for Skylanders. Toys cover almost every inch of the studio. More Spyro Reignited Trilogy artwork hangs along the walls. This isn’t just a studio making these games. It’s a studio that loves what they do. Remaking a trilogy of games requires more than just an overhaul of the visuals. Stephan Vankov’s office looks like what you’d expect a music producer’s to. Baffling covers the walls, massive speakers flank a couple of monitors, and various pieces of music gear cover his desk. Music is a strong part of nostalgia, and while our mind may fill in the blanks on the limited graphics of the PS1, getting the music right was essential to recreating the experience that people remember. Vankov had to sift through hundreds of samples to find the right ones that matched the instrumentation of Stewart Copeland’s originals. While Copeland didn’t directly have a hand in the Reignited soundtrack, Toys for Bob consulted with him during the process. He also contributed an entirely original track called Tiger Train, the Spyro Reignited Trilogy’s main menu music that incorporates elements from a number of familiar Spyro songs. Players who don’t want the new tracks can turn on the classic versions of the game’s hundreds of tracks. The only modifications Vankov made to those originals was finding a looping point so that the songs don’t abruptly stop and restart. With the Reignited soundtrack enabled, players can choose to turn dynamic music on or off. The dynamic music ties in with the world and player’s actions more, featuring four variations. Base is the normal song as recreated by the audio team. Idle is a calmer variation that comes on when there is no player input for a few seconds. Charge adds a percussive rhythm to the music as Spyro uses his charge move to attack and move around, and inside adds a small amount of reverb when the player moves to interior locations. There are also slight alternate versions of the base track that will play to add a small amount of variety to the longer levels. 20 years ago, game development was quite a bit different than it is now. Toys for Bob’s Studio Co-Head Paul Yan talked about the limitations of the time, before showing us multiple three-ring binders labeled “Game Design Bibles.” These old binders were filled with Insomniac’s original vision for Spyro. Levels were mapped out on graph paper. 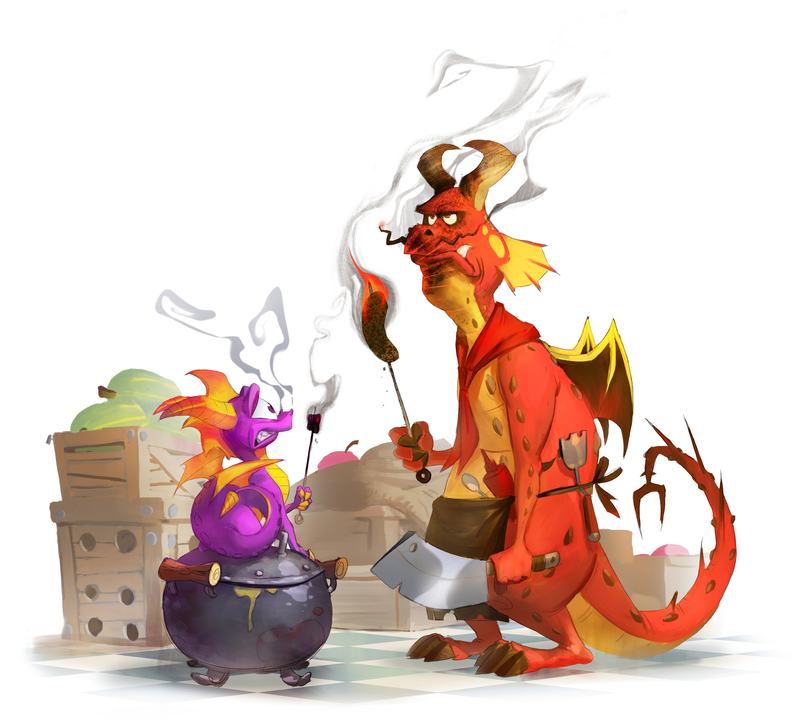 Pitches for the game originally cast the lead character as a completely colored dragon with a different name, even going as far as to describe the game as a “realistic shooter” at one point in very early drafts. These enlightening documents aren’t just a fun piece of history. They allowed the team at Toys for Bob to create a skeleton of intent for the original games. Instead of slapping a fresh coat of paint on everything and calling it good, the studio wanted to develop Spyro as if the idea had just been hatched today. What did Insomniac intend, but couldn’t convey due to the technical limitations of the console at the time? Original Intent was one of the core pillars that the project stood on during development, giving some freedom to move around outside an exact one-to-one recreation of the classics. The first thing that the team knew they had to get right was the design of Spyro himself. There’s some amount of contention over the Skylanders redesign of the purple dragon, but Toys for Bob almost sees that as a separate iteration of the character. Spyro’s Skylanders design was never up for consideration, but how to update that original simple polygonal model and keep the original intent intact? The Reignited Trilogy’s Spyro model has more polygons in one of his eyes than the entire original PS1 character did, yet somehow that original character was able to offer a wide range of emotions. 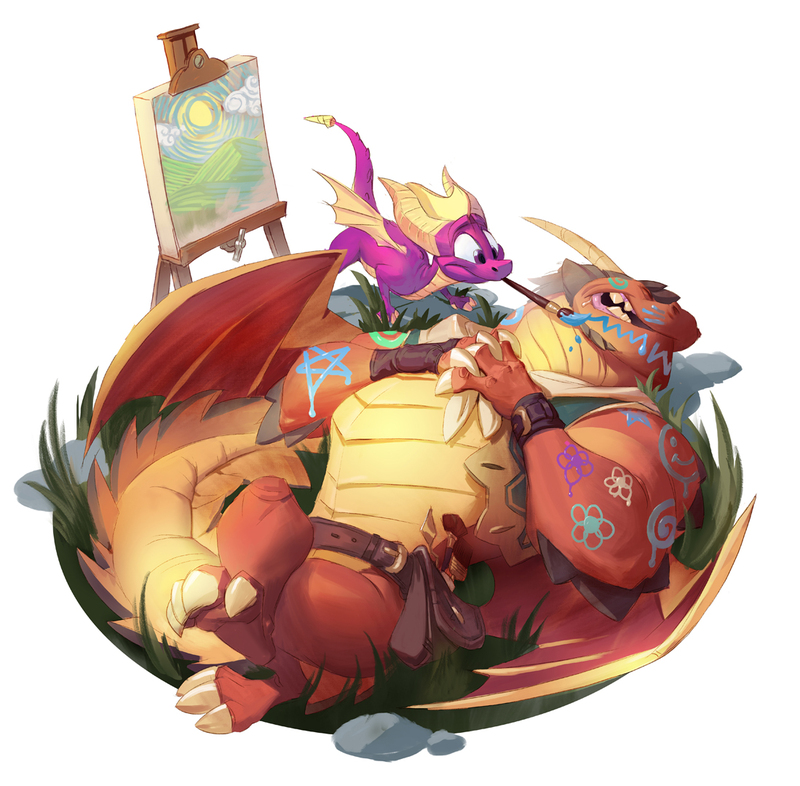 That was the philosophy behind redesigning all of the characters—more than 700 in total—from the various artisan dragons right down to the random fodder on the ground. 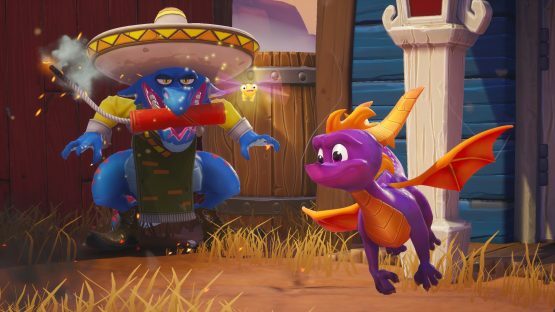 Toys for Bob’s Josh Nadelberg headed up the art direction for the Spyro Reignited Trilogy, and they didn’t allow themselves to be constrained by original design. Instead he tapped into the original intent behind who and what each character was using their voice lines and context in game. This allowed them to easily fill in the gaps, updating the relatively simple designs of yesteryear to fresh and interesting characters. Nadelberg’s intent was to make the visuals of each character tell a story. From battle scars to random odd accessories that immediately communicate who they are, every single dragon, rat, frog, sheep, and foe was given the same treatment. In talking to Nadelberg, it was easy to tell that the art team had a lot of fun creating and animating these characters. Starting with initial design sketches and building all the way to their rigging, they made sure that the world felt alive and full of personality. While some of that character personality is sure to cause a bit of contention, Nadelberg is confident that his team, full of people that love Spyro, is on the right track. Memories are fickle things. The term rose-colored glasses comes to mind as people think back on games of old. When we say that something hasn’t aged well, often it’s because the original was part of a different time, and our memories fill in the gaps. If Toys for Bob were to simply do an up-rez of the original, there’s a good possibility those classic games wouldn’t meet today’s gaming standards. So the studio set out to create a game based on memories, again by locking into the intent of the originals, rather than the exact execution. Don’t worry though, things will still be almost exactly like you remember. Using a fancy tool called a “Spyro-scope” (a Spyro microscope), the team was able to emulate the games and extract a large variety of data points, from the exact scaling of each level to how Spyro and the enemies move around within those environments. They were then able to pull this data into Unreal Engine 4, smooth out some of the janky edges in the original numbers, and get a game that plays just like the originals, but still feels good to a modern gamer. That’s probably the Spyro Reignited Trilogy’s most notable accomplishment. It’s the Spyro that I remember, yet also looks and feels good enough for the players who aren’t banking on nostalgia in order to love the game. Toys for Bob managed a strong balance, recreating 20-year old memories and allowing a brand new generation to make fresh ones. Senior Producer Peter Kavic was more than happy to show us just a small sample of appreciation that the studio has gotten from the fans, eager to relive their own memories and share Spyro with a new generation of players that missed the original trilogy. Handwritten letters, emails, tweets, fan art, tattoos, and more betray the people for whom Spyro has had a major impact on their lives. At Toys for Bob, that’s what drives them. Being fans themselves, he talked about various people within the studio that were eager to work on their favorite level or character. Kavic talked about a culture at the studio that was ignited by a passion for Spyro and fueled by the fans. It not only keeps them going every day, but it keeps them smiling and excited, happy to be working on a project they care so much about. The Spyro Reignited Trilogy is more than just remaking some old games. It’s a passion project by dedicated fans for dedicated fans. There, in that quiet and unassuming hangar in Novato, a smiling and excited team gets ready for launch. They haven’t just been developing a game. They’ve been shaping memories, old and new. Travel and accommodations for the Toys for Bob studio tour provided by Activision. We’d like to thank Toys for Bob for opening up their studio doors and allowing us a quick glimpse into their world just before the Spyro Reignited Trilogy release.